One of the purposes of the Vacationland Dog Club is to encourage and promote the raising, general care, and training of purebred dogs. Therefore, we, as members, do hereby set forth this Code of Ethics. We will not engage in the breeding of non-purebred dogs. We will discourage the breeding of dogs of unknown or questionable lineage. We will not engage in selling our dogs through a retail pet store or purchase dogs primarily for the purpose of resale. We will acquaint ourselves with, and abide by, the American Kennel Club rules of record keeping, breeding, and sale and transfer of purebred dogs. We will furnish with each sale a proper registration application or an individual registration certificate, at no extra cost. We will furnish the buyer at time of sale: a pedigree showing at least three generations, a schedule of dates and types of immunizations administered, a schedule of dates when worming was done and type of medication used, or date stool was checked and found free of infection. If the dog has had surgery of any kind, serious infections, or special treatment, written notice will be given, which will include the name and address of the attending veterinarian. We will furnish at time of sale: written instructions to the buyer on feeding, health, training, and grooming, sufficient to enable him/her to properly care for the dog. We will sell only dogs of sound temperament, in good health and condition at the time of sale, and will provide a written guarantee to that effect. We will offer return privileges for at least 48 hours if, upon examination by a mutually acceptable veterinarian, who shall state in writing the reason or reasons the dog proves unsatisfactory. Agreements of price, payment, and term of guarantee beyond date of sale are between the buyer and the seller. All such agreements, guarantees, and conditions shall be in writing and signed by both parties with copies retained by each. 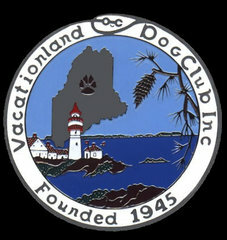 This Code of Ethics is set forth by Vacationland Dog Club as a standard of excellence to enable both breeder and purchaser to be aware of their rights and responsibilities.